For the sailing enthusiast who wishes to participate in a sailing adventure come aboard the world's highest pedigree 60 foot cruising catamaran, and take command of the Yapluka 60, Sete Mares. Custom designed with a layout for an owner, his family and guests, and built by Yapluka, the premier sailing catamaran builder in the world, it is more spacious and luxurious than those catamarans designed for charter use only. To add, Sete Mares is uniquely offered for charter with an option of a Captain only on board, providing you with maximum privacy and a lower charter cost. The Captain is there only to assure your safety and maintain the yacht's systems in full operation. 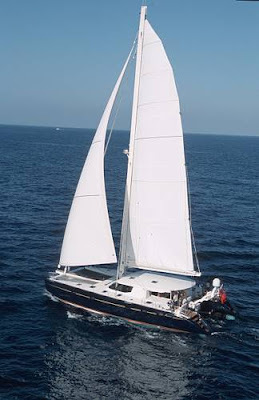 Instruction in large vessel sailing and operations is offered as well, at no additional charge. If so desired, for an additional cost, a chef, additional crew, and full provisioning can also be arranged upon request. The Interior of Sete Mares is fitted out with beautifully finished South American hardwoods and the most immaculate joinery. It has a luxurious feel from salon and cabins to the gold taps and other fittings in the bathrooms. "Sete Mares" sleeps 6 plus 2 crew in 4 x 2 large staterooms. Comfortable deck saloon with dining table and surrounding sofa for 8 to port. There's a navigation station and further sofa to starboard. The starboard hull contains a forward double cabin for crew with upper and lower bunks and a separate deck entrance and a head and shower. In the remainder of the starboard hull, there's a completely separate (was private owners) aft cabin with twin berths, writing desk, large en suite head, and shower with gold plated fittings. The port hull has a double cabin aft also with en suite head and shower. The beautifully fitted modern galley is amidships and has Corian work tops. The galley is fitted with panel hidden household size fridge and freezer, dishwasher, and microwave. A fourth two berth cabin is forwards of the galley with an en suite head and shower. The large covered cockpit aft has a dining table and settees to port. Starboard and aft makes a very comfortable outdoor saloon it is a delightful safe area to relax.